What's big and red and eats rocks? No, you won't find it at Illy. It's surprisingly disappointing. And I'm not even going to mention the pastries there. Anyone has a better idea? As soon as we stepped off the boat yesterday, we stepped onto a plane and headed out here to Vegas. The fun's already begun last night with the Michelin party at the Wynn and then the after party at Blush. More on that later. I'm here through the weekend for the James Beard Foundation Taste America events. It's going to be fun. If you're here, be sure to say hi. No, not really. Not quite yet, at least. But if you are wondering where I've been, this picture should give you an idea. This year, David gave me the most fabulously fabulous birthday present, ever, an 8-day sailing class package for the two of us to take together! 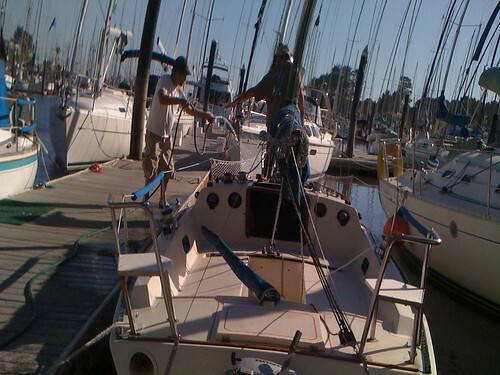 So that's where I've been in the past few days, busy learning how to tack and jibe and tie a lot of knots. Not to mention figuring out how to cook on slightly dodgy, if fascinating, boat stove. Yes, we're living on a boat as well--not the one in the picture but a larger one docked nearby! My blog might be a bit slow for a few more days. For a more up to the moment stuff, you can follow me on Twitter and Plodt. Or, you can just check on the middle column here on Chez Pim where I will be posting regular pictorial updates via my trusty--if also slightly dodgy--iPhone camera. Besides being a tardy blogger and juggling about a gazillion things at the moment? Well, baking this stuff is one. What are they? Plum coffeecakes! 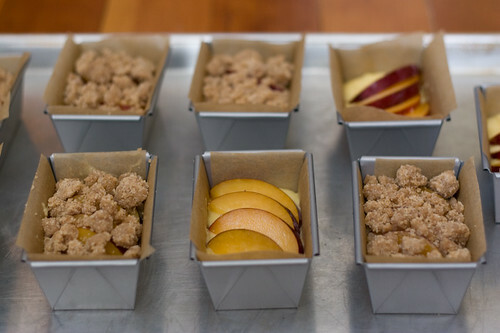 Tender crème fraîche batter, fragrant slices of plum, buttery crumb on top, baked into the cutest little loaf pans I brought home from Paris.